THANK YOU to all the men and women who serve and fight for our country! Inspired by this weeks Mojo Monday Sketch, I used images from the Artistic Outpost Hero and She-roes plates. All pattern paper is from the Authentique Glory Collection.The light blue panel is embossed with the Cuttlebug Stars Folder, then sponged with Ranger Gathered Twigs Distress Ink. The Flag is from the She-roes plate, colored with STAEDTLER Mars Graphic Markers, and stamped on Vanilla card stock. The sweet little solider boy is from the Hero plate, stamped in Black Archival on Vanilla card stock, colored with STAEDTLER Karat Aquarell Watercolor Pencils blended with Gamsol. 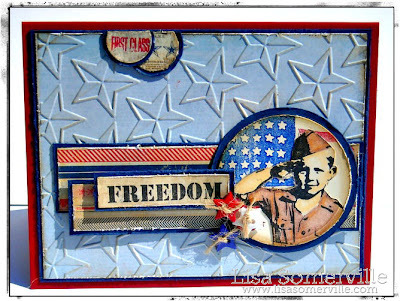 I cut out the image and adhered it to the flag panel with Scor-Tape sheets, then die cut with Spellbinders Circle Dies. To embellish, I added a few RWB Stars tied with Twine. Such a fabulous card! Thanks for playing Mojo Monday! Lovely card, and the perfect day to share it. FABulous, what a beautiful card, and love the lo! Beautiful! Love how you celebrated our heroes! Sweet use of the sketch and that sweet boy!